This Museo Mundial Project installation that has been installed in the Castle Museum of the Budapest History Museum deals with the mother–child relationship and the topic of feeding a child in the Bronze Age. 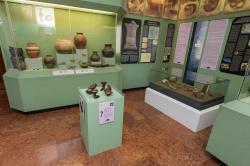 The installation is situated on the second floor of the Castle Museum in the permanent exhibition “Ancient peoples, antique cultures”. 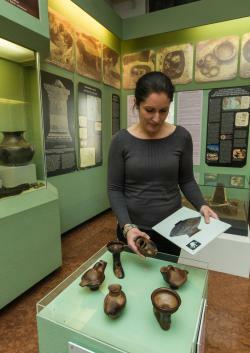 This exhibition presents the history of people living in the Budapest area through archaeological finds. The installation consists of six replicas of pottery dishes from the Late Bronze Age (13th to 9th century BC) that were found in graves during excavations in Budapest. The originals are exhibited in the showcase next to this installation. Visitors are invited to touch the replicas and to guess what they were originally used for. In addition, the installation is placed next to the burial of a mother and her child from two thousand five hundred years ago, which was excavated by colleagues from the Budapest History Museum in 2009. The grave can lead the visitor to the topic of maternal mortality through the intimate way that it is presented and through the impact of its content. The installation is visible right from the start of the exhibition. This is the only place in the exhibition where there is an interactive element. This helps grab the attention of visitors. The grave is the only one in the exhibition that contains the remains of human bodies. It is one of the largest and most significant archaeological finds from the Scythian period in the capital. 109 graves were found belonging to a community that existed there in the Middle Iron Age (6th to 5th centuries BC). One of the most interesting sites in the cemetery was this double grave that was excavated in the same state in which it was found (in situ) and put on exhibit. In this grave, a child aged around six or seven was placed on the left shoulder of an adult woman who had been laid on her back, originally with her knees pulled up. The child, who is curled up (in the so-called foetal position), has its face turned towards the woman, presumably the mother. The head was placed in a bowl propped up by a rock. While we can do little more than guess at the causes of death of persons who died 2,500 years ago, it is beyond doubt that they were buried at the same time. During the ceremony, presumably conducted by the family, they strove to send off the mother and the child in her arms in a manner that best expressed their close bond to each other. The installation itself consists of six replicas of pottery dishes from the Late Bronze Age. The visitor can touch them and check her/his guesses against detailed descriptions of the objects on touch panels. They can identify the objects through photographs. One of them, for example, is shaped like a bird, another like a boot, and the third like an egg with a hole in its side. We presume that the vessels shaped like birds and boots were used only on special occasions, while the so-called “nursing beaker” can be regarded as a predecessor of today’s nursing bottles. Behind the grave, in a showcase on the wall, the visitor can read about maternal mortality today. In this way, the installation is linked to Millennium Development Goal (MDG) 5 (“Improve Maternal Health”). 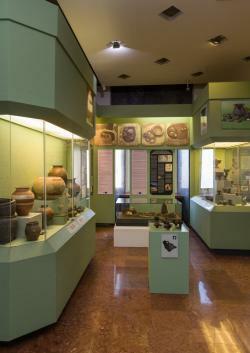 The part of the installation with pottery leads the visitor to the topic of feeding children. According to the hypothesis, people in the Bronze Age were already trying to come up with tools that they could use to simplify the feeding of children. Through this connection, we want to make the visitor think about the situation today. This part of the installation tries to imply MDG 4 (“Reduce Child Mortality”). We wanted visitors to kind of “bump into” at least one of the five installations on one of the floors of the museum (the museum has four floors in total). Moreover, the permanent exhibition “Ancient peoples, antique cultures” is one of the least interactive ones, since it was built around the early 90s. In addition, it has a very specific design and it is quite densely furnished. It includes nursing vessels, both from ancient times. It shows that this type of tool, which facilitated the feeding of babies in ancient times, has remained useful over thousands of years. Furthermore, around the same time, a temporary exhibition of a tomb of a mother and her child and accompanying artefacts – in which a mother and child are embracing each other closely – was added. They tried to find a permanent spot to exhibit these artefacts. Thematically, the grave had to be placed next to the nursing vessels, so this is how the location and the subject were combined. 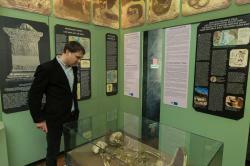 At each installation, we worked closely with the curators of the permanent exhibition. In each case, they provided the content (materials) for the installation as well as the descriptions about the Bronze Age artefacts. At the same time, we obtained materials and information on the historical background to the issue of maternal and infant mortality. Additionally, we had to collect information on the current situation on these issues. The installation had to fit in with the permanent exhibition, so we worked with the exhibition’s original graphic designer. We highlighted and emphasized the descriptions on the project’s topic area through the use of colours and we consciously placed the interactive stand in the visitor’s path, so that he/she would approach it automatically and take a look at it. Its size is also distinctive compared to everything else in the room. In order to have a suitable place for the information panels on the wall, we covered a window in the exhibition room. Carpenters made the stands while the glass cabinet for the grave was donated to us. The grave was transported by a transportation company specializing in artefacts. The museum staff helped with the installation on the walls. Within a traditional exhibition, we managed to find a way to implement an interactive installation. The topic of today brings the past closer to the visitor. The grave and the installation are the part of the exhibition where visitors spend the most time during their visit to this exhibition. The pottery replicas are fragile. Although they are fixed by metal cords, they fall regularly onto the pedestal and get broken. They have to be mended regularly. For the replicas of the pottery dishes, we used the same material as the originals, but they are too fragile. Although they are fixed by metal cords, nevertheless they fall regularly onto the pedestal and get broken. We would use a softer covering on the pedestal in future. The visitors look at the grave and touch the replica pots from the Bronze Age. In the survey, almost everyone wrote that this installation taught them the meaning of maternal mortality.